WEX Worldwide: The City that Never Sleeps, Latin American Style | WEX Inc.
Want to know what it’s like to live and work in São Paulo, Brazil? Our blog series, WEX Worldwide, goes straight to the source, asking our international employees why they love our locations—and why you will, too. Following our profile on Music City, USA, we’re heading south to catch up on life in Brazil—thanks to the WEX employees who work in the country’s capital, São Paulo. It seems in the modern-day megacity of São Paulo—population 13 million—that nothing is done in small doses. The metropolis is home to multiple “bests” and “biggests,” some that you have surely heard of (the famed annual Carnival) and some that may be a total surprise. For example, did you know that the city has the largest helicopter fleet in the world, with more than 200 heliports, where approximately 1,300 aircraft land and depart daily? São Paulo also has the largest Italian community in the country—and the melting pot doesn’t end there. There are between 1.5 million and 2.5 million Brazilians who are of Japanese descent. And with the largest openly gay community in Latin America, the annual gay pride parade is considered the largest in the whole of South America. São Paulo is the foremost business center of Latin America and serves as a hub for WEX’s expansion into more countries and cities in the region. 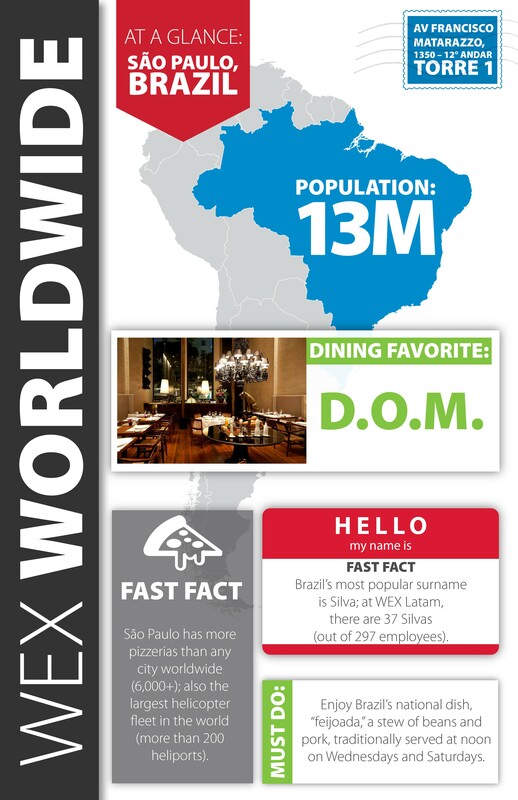 Working at WEX Latam gives one the opportunity to speak three languages—Portuguese, English and Spanish, given the expansion plans. Accordingly, WEX Latam is the only office to serve all of WEX’s lines of business based on one single platform. More than 90,000 events are held in São Paulo every year, including the São Silvestre Race, which attracts an average of 15,000 runners from about 20 countries. Even a day with nothing out-of-the-ordinary scheduled is a pretty spectacular day in São Paulo, with attractions including the largest mall in Latin America, hundreds of theaters, museums, parks and green areas. Interested in a career at WEX? Check out open positions on our careers page.